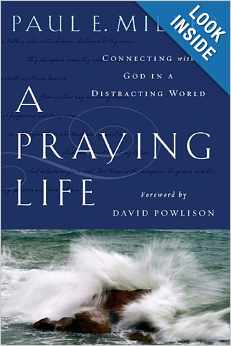 A Praying Life by Paul Miller. It was recommended by a girl I follow on Instagram @amyhale. It's so good! in my new shoes. 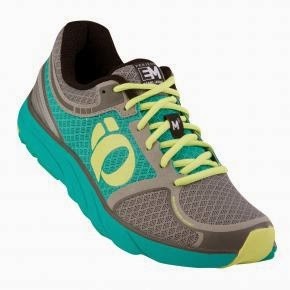 I finally broke down and bought new running shoes because my hips were hurting so bad during and after every run. I was holding out because I really hate how much good shoes cost, but I immediately noticed a difference and don't regret the splurge one bit. I have finally broken the 5 mile mark. I was stuck at three miles forever but just 2 weeks with my new shoes and I'm on my way to a 10K!! my fit bit zip. I'm kind of addicted to it. I had quit wearing it for a while but started up again a few months ago and it really makes a difference for me. I can't stand to go to bed if I haven't met my daily steps goal!! I find myself purposely moving around a lot more when I'm wearing it. I park further away when I go to stores, I pace around the kitchen when I am helping with homework, I break into spontaneous dance parties more often and I jog in place at 5 minutes til midnight just to get a few more steps in. It is super motivating. I heart it! I am thinking about upgrading to the Fit Bit One soon because I would love to track my sleep! a lot less Diet Dr. Pepper and a LOT more water. I've cut my Diet Dr. Pepper intake in HALF!! That's huge, people!! I won't share with you how much I was drinking each day because honestly, it's embarrassing. I haven't been to Fiesta Mart for a fountain drink in 3 weeks!!! I had horrible headaches the first week or two but I am starting to get used to it. Soon I might even try to cut back again. I can't imagine NEVER drinking Diet Dr. Pepper...I love it too much...but I think it was time I cut back a little. Okay, a lot! lots of mini spirals. They make great gifts! 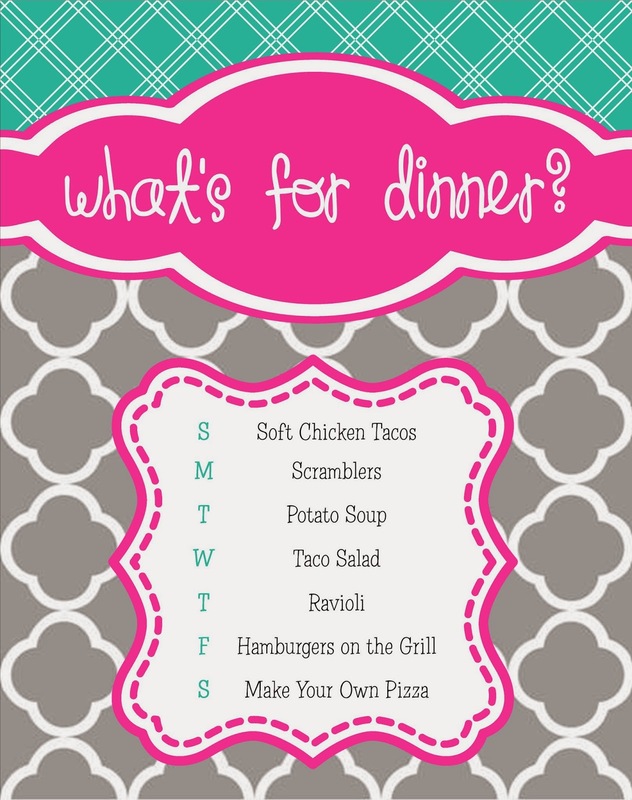 What are you having for dinner this week? Here's our menu. I'm excited about this week...it's making me hungry just typing this post! Graham is going to be in the Oklahoma Spelling Bee on Friday night (so proud) but I'm hoping we can avoid eating out and just do a Find It, Fix It, eat it night before we run out the door. Saturday night, 2 out of 3 kids will be gone so we may use that to our advantage and eat out that night. I have found that it's hard to eat out and eat healthy though so if you have any great suggestions for Tulsa restaurants, I'd love to hear them! 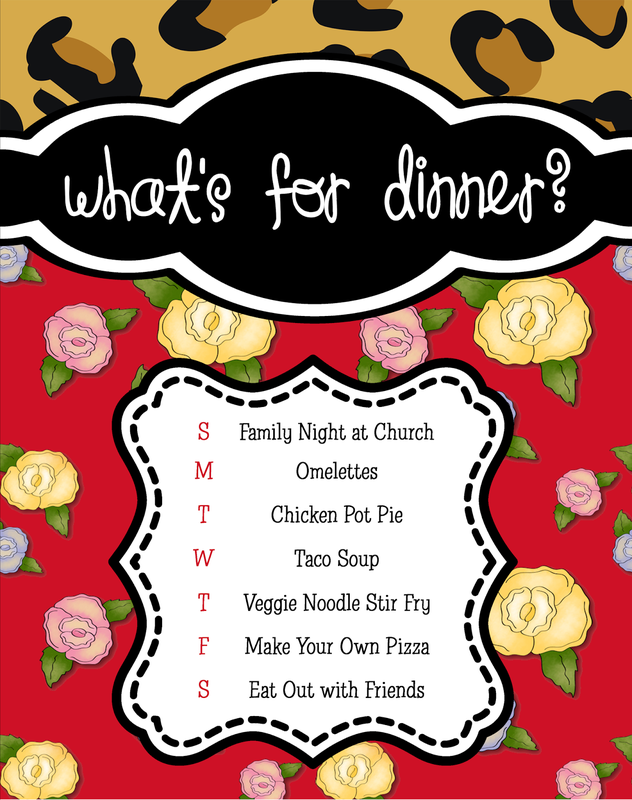 So, I've made it pretty obvious with my weekly "What's for Dinner" posts that I am on a meal planning kick. Actually, since I've kept it up for 3 months straight, I'm going to say it's not a "kick" anymore...I'm just a meal planner! I love that we are saving money and eating healthier. Now that I have dinner planning down, I've gone a little overboard and I've moved onto breakfast, lunch and snacks! We already had the kids plan down so I didn't have to worry about that. I'm the only one here for lunch during the week and I haven't been able to convince Nathan to start packing a healthy lunch yet so the lunch meal planning has been pretty easy. The discovery of Salad in a Jar has been wonderful and I'm also a bit obsessed with Naan homemade pizzas. I tend to just switch back and forth between some variation of these two but if I don't plan ahead, I find myself on auto pilot to the nearest Chick-fil-A. I am also trying to add healthy breakfasts and snacks to my plan. When I don't plan these meals and snacks, I find myself skipping breakfast completely and then running to the store all the time for snack food OR grabbing something like potato chips and candy. I'm a late night snacker and if I don't have something good for me on hand, Fruit Loops are the first thing I reach for! Even when I plan to eat at home, if I don't plan the menu exactly, I found myself running out of food by Wednesday or Thursday and we end up at the grocery store again. 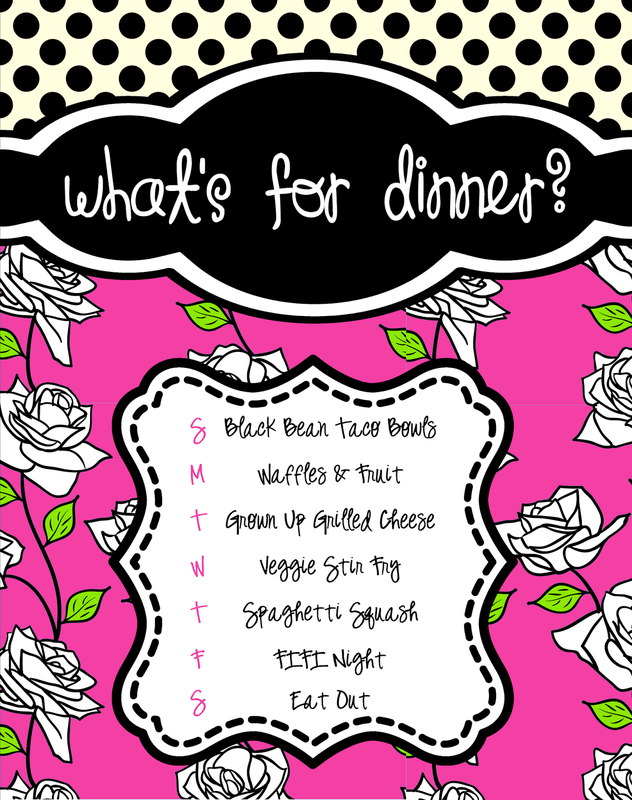 It's no secret that I'm a Plan it on Paper nerd so it's no shocker that I came up with a Meal Planner note pad to make my meal planning easier. Now I can jot down all the meals/snacks when I am doing my meal planning and making the grocery list. I'm not so type A that I stick to it exactly but it helps to have an idea of what I'll need for the week before I head out to the store. I also like preparing as much as I can on Sunday to save me time throughout the week. I'm trying to cut out as much processed and fast food as possible and I've learned that it takes a lot of prep work to make that happen. If you are in need of some meal planning tools, these 40 page note pads are in the shop now. You choose your colors!